Astronomers once thought asteroids were boring, wayward space rocks that simply orbit around the Sun. Astronomers once thought asteroids were boring, wayward space rocks that simply orbit around the Sun. Only in science fiction movies were they dramatic, changing objects. New observations are turning science fiction into science fact, showing that asteroids are anything but dull. Asteroid Gault, discovered in 1998, has begun to slowly disintegrate. The crumbling was first detected on Jan. 5, 2019 by the University of Hawaiʻi Institute for Astronomy (IfA) Asteroid Terrestrial-Impact Last Alert System (ATLAS) telescopes on Maunaloa and Haleakalā. "Each night, the ATLAS survey scans the sky looking for hazardous near-Earth asteroids, and we also observe tens of thousands of known asteroids in the main asteroid belt," said Larry Denneau, ATLAS Project Scientist. "Our collaborator Ken Smith in Belfast found an unusual looking moving object, and he alerted us that it might be a new comet. 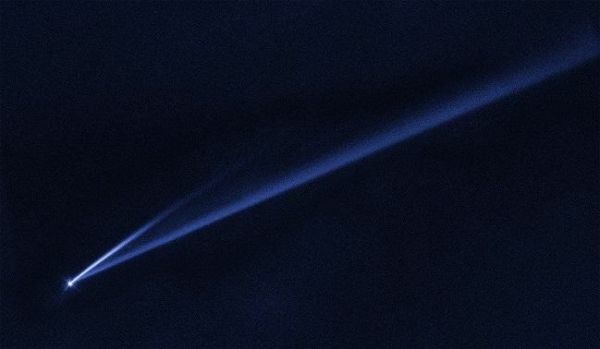 Instead, it turned out to be an asteroid in the main belt that just developed a comet-like tail. These events are rare and mysterious, and we were lucky to detect the event right after its turn-on." Gault is a well-known asteroid, and the newly found tails are the first evidence of any misbehavior. These new observations suggest that asteroids are dynamic, active worlds that can ultimately disintegrate due to the long-term subtle effect of sunlight, which can slowly spin them up until they begin to shed material.